"Back in school with a badge and a gun." Once in a great while, we are privileged to experience a television event so extraordinary, it becomes part of our shared heritage. 1969: Man walks on the moon.1971: Man walks on the moon… again. Then, for a long time, nothing happened. But on April 5, 1987, a seismic occurrence made the above Simpsons reference—and all Simpsons references—possible: the launch of the Fox Broadcasting Company’s first primetime lineup. The TV upstart more commonly referred to as Fox had been on the air since October 1986, but its challenge to the dominance of the United States’ Big Three broadcast networks began in earnest the following spring. Thanks to YouTube user Sherilyn Connelly, you can relive that evening’s introduction to the Bundys of Chicago and Tracey Ullman of the U.K., following a high-stakes defacement of the Hollywood sign. Yes, even in its infancy, Fox had an attitude. The network would continue adding new series in the Sundays that followed, supplementing Married… With Children and The Tracey Ullman Show with sitcoms Duet (“for the first time, a real romantic comedy in real time”) and Mr. President, the latter being a George C. Scott vehicle produced by Johnny Carson and Taxi, Mary Tyler Moore, and Cosby Show veteran Ed. Weinberger. 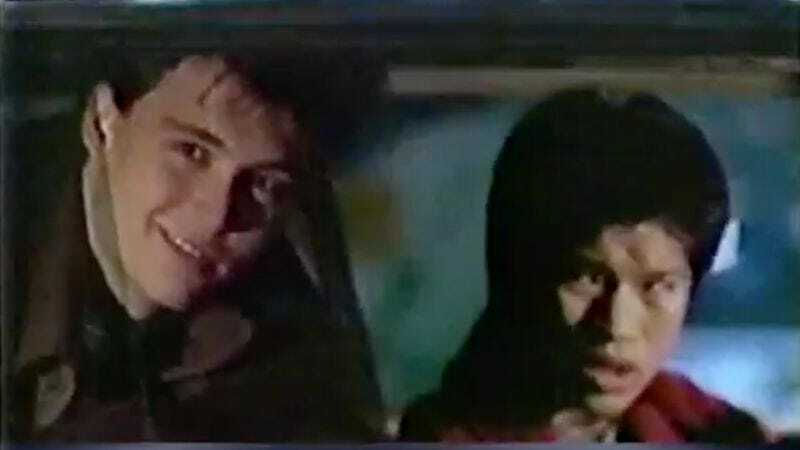 But before Duet and Mr. President, though, there was the feature-length pilot for 21 Jump Street, promos for which put the word “babyface” over a smiling Johnny Depp, an implication of innocence that doesn’t really stick three decades later. And what about our old friends the Simpsons? Well, they wouldn’t be stopping by to say hello between Tracey Ullman sketches for a couple more weeks. Until then, the show—whose cast featured eventual Springfield residents Dan Castellaneta and Julie Kavner—utilized the lightly comedic medical misadventures of Dr. Janice N!Godatu. Created by M.K. Brown, Dr. N!Godatu would alternate with Simpsons shorts throughout Tracey Ullman’s first season, before the animators at Klasky Csupo turned their attentions entirely to Homer, Marge, Bart, Lisa, and Maggie in season two. And the rest, they say, is history—or “Fox-story,” if you want to get cute about it.